I am not aware of any option/facility/service provided by Evernote which would require any of these permissions. Is Evernote Malicious? The reason for "phone calls" might be quite easy: Looking at the app requirements, they list "Android 1.6 or higher". With that, this permission is automatically set -- whether the developer wants it or not. Reference: Android 1.6 Changelog. An interesting discussion on this permission can be found at StackOverflow: Android permissions: Phone Calls: read phone state and identity. Of course this might not be the only reason. If the app e.g. lets you take "call notes" for an ongoing phone call, it might want to connect it with the contact or at least the calling number. To get the contact, it needs the number. To get the number, it needs... yes, READ_PHONE_STATE. Not using EverNote, I cannot say if it offers such a feature. As for accounts, pick reasons from above: How to share on your Twitter and/or Facebook accounts without accessing them? So all mentioned permissions could be easily explained. Could, as it takes some guess-work. You may be able to tell my assumptions are true if you investigate the described features. But the devs should be able to confirm or deny -- and IMHO it is their responsibility to explain. My suggestion to developers always is: If there are sensitive permissions involved, split the connected functionality into addons/plugins. My standard example: Locus Maps. It needs internet access to load maps, that's crucial to the app. Being a navigation app, you might want it to navigate you to your friends -- so accessing your contacts makes sense. But that together with internet, well... you might be concerned. So Menion (the dev) moved this part to a (free) addon. Choice is up to you: Trust him (and install the addon), or enter all addresses manually. And for another thing I agree with a point mentioned here a couple of times: A 4.7 star rating with almost half a million downloads, I'd say if that app were malicious, we'd have heard about. Allows the application to access the phone features of the device. 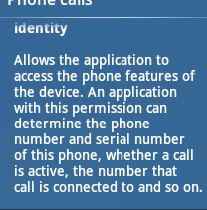 An application with this permission can determine the phone number and serial number of this phone, whether a call is active, the number that call is connected to and so on"
I think it needs calls to make some appointment from them and all the other permission are maybe in the same feature class. I think other users are having similar concerns about other apps from big providers like facebook see here. My take would be to ask directly Evernote why they need those features enabled. This is no way a singular incident see a similar concern here. I don't think since Evernote is quite big they would do something like that, and if would do so it would be something so easy to see. Actually when you are developing for android some methods would require this kind of permission, if i'm not wrong, if you want, for example, check for data connection needs READ PHONE STATE AND IDENTITY or for some advertising..
Why does Google Search suddenly need a lot more permissions? What is “srv_listen” permission used for? Why does every app has/needs the permission “Send MMS” and “Send Email”? WAP Push messages - what and why are they? Can an app update from Play Store reinstate its permissions I've disabled earlier? Is there anything malicious with play support libraries?